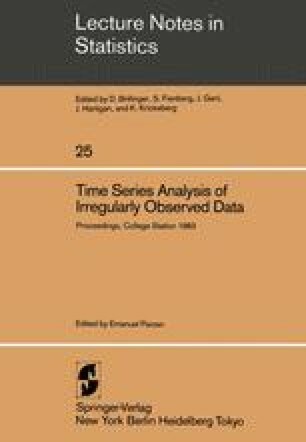 This paper surveys the current state of large sample theory for estimation in stationary discrete time series observed at unequally spaced times. The paper considers the nonparametric estimation of sample covariances, correlations and spectra and traces the development of consistency and asymptotic normality results for these quantities. The second part of the paper discusses the estimation of finite parameter models for stationary time series. Consistent, but inefficient, methods based on sample covariances and on spectra are discussed and compared. The final part of the paper reports on the recent results concerning a general central limit theorem (for the estimate obtained by a single iteration from a consistent estimate) for Gaussian data. The essential condition on the sampling times is that the finite sample information matrix, when divided by the sample size, has a limit which is non-singular and has finite norm. This condition will be illustrated by considering examples of periodic sampling, of random but time homogeneous sampling, of sparse early sampling, and of asymptotically stationary sampling. The effect on efficiency of the design of sampling pattern will be briefly discussed. Finally it will be indicated what extra complexity of proof is needed to handle the non-Gaussian case.